You may have heard of this before but let me encourage you to play along. It may seem odd to suggest that Almighty God might not know something. How can the God who knows when a sparrow falls to the ground anywhere in the world or and who has numbered every hair on every human’s head not know something? God even records every day of our life before we were born. Many of us are aware the Bible states that God is Omniscient (all knowing), Omnipotent (all powerful), and Omnipresent (every where all the time). He is the Alpha and Omega the beginning and the end. Even some leading Astrophysicists, Molecular Biologists and Scientists involved in Quantum Mechanics, have acknowledged that some super-intelligence or master engineer had to have overseen the events of Creation or the Big Bang to bring the universe to where it is today. Why do they believe this? Because scientists now know that just to create one simple cell requires the simultaneous existence of dozens of proteins and amino acids. In other words, these components had to show up on the scene at the same time. Furthermore, there needed to be even smaller molecular machines transporting the DNA information throughout the organism. This irreducible complexity doesn’t even factor in the massive amounts of sub atomic particles like atoms, consisting of protons and electrons, which are made of smaller things called “quarks”, which have recently been discovered to consist of even smaller things called “preons”,… all of these things have to be properly aligned and precisely balanced for life to exist. Scientists have also observed all these components are being held together by some invisible, vibrating energy or power. If the testimony of Scripture is that God holds our lives and every atom of our universe together, how is it possible for us to state that God doesn’t know four things? Just what are these four things? Number 1 – The First Thing God Doesn’t Know, is a Sin He Doesn’t Hate! Why does God hate sin so much? Because He sees it for what it really is. He knows the eternal consequences of sin like no one else. He understands it in its entirety. To sin means to miss the mark, to fall short of the glory and holiness of God. Furthermore when we miss the life and the glory of God, we hit something else that is not God. Whatever is not part of God, will ultimately die because God is the source of life. We are like a battery that will eventually go dead without a connection to the eternal life in God. In fact, our life has just enough battery life to allow us to decide whether or not we want to be plugged back into the source of life. That’s what our free-will is all about. Since God is the source and author of all love, all life, peace, joy, happiness, health and fulfillment, He hates it when we miss Him and hit the death that comes with sin. God see’s the enormous domino effect it has on the human soul and society. God not only sees the damage caused to the one who has sinned, but the ravaging effects it has on others. There is always collateral damage with sin. Sin is like sticky tar; it gets on everything. We all know about the horrors of the pride and greed of people like Nero, Napoleon, Hitler, Stalin, Mao, Po Pot, Kim Young IL, which we are responsible for killing hundreds of millions of people. But sin affects every person right where we live. Right now, there are people in positions of authority that are sinning and their sins are going to affect every one of us reading this. The pharmacist who is lustfully distracted by someone in the office and prescribes the wrong medicine. The drunken airline pilot that crashes his plane killing hundreds. The pornographer that produces programing that objectifies woman and destroys families. The food inspector who accepts a bribe and lets tainted baby food into the marketplace, killing dozens of precious babies. The greedy building contractor, who cuts corners with inferior building materials to make more money, and looks the other way when the bridge or high-rise building collapses killing hundreds. The Bernie Madoffs of the world, whose sin of greed will wipe away hundreds of thousands of retirement accounts. The CEO of a military corporation that foments the drumbeat for war in the press which will kill thousands just to keep his stock price high. The criminal behavior that results in every one of us paying higher taxes for police, judges, lawyers, courtrooms, parole officers and prisons. The subtle compromises we all make that allow Hollywood to fund God-hating movies and television programs year after year. The news media executives that encourages political conflicts for higher ratings and for the profits that come with them. Those of us who are carry bitterness and anger for whatever reason end up damaging and emotionally alienating our children, who will often turn to alcohol or drugs to medicate their emotional and psychological wounds. And the cycle continues, generation after generation. The tragic consequences of our Godlessness and our immorality, is finally breaking the bank of our government. Every time we choose to live contrary God’s laws, we suffer and so does our nation. The government grows bigger and bigger as it tries to fill the gap created by absent fathers. Washington tries to provide the food stamps, child care, and the medical and housing subsidies, along with the increase spending for the costs of crime, which is always associated with inner city, single parent households. God doesn’t know a sin He doesn’t hate because it is all deadly to our soul. Sin is like Bologna – it’s all sin, no matter how thin you slice it. You might not think you have sinned much, but who do you compare yourself too. Mother Teresa who gave her entire life away to God by serving the poor in the slums of Calcutta, India – said she was helplessly lost and in desperate need of Savior. If she needed a Savior after a lifetime of service where do you and I stand? We fool ourselves when we compare ourselves to others we think are worse than we are. It is all sin and it makes all of us guilty. Remember Rat Poison is 99% food and only 1% poison. A glass of water can have over 10,000 drops of pure water in it, but 1 drop of anthrax in it will kill several men. Would you drink a glass of water with one drop of anthrax in it? Jesus gets to the heart of how deadly sin really is. None of us escape the consequences of sin – even the cowardly and unbelieving tops the list of sinners listed at the end of the Bible. Probably the greatest reason God doesn’t know a sin He doesn’t hate is because it separates us from Him. We forget that God is a being of a whole different order than we are – He is holy, holy, holy! Remember God is the just judge of the entire universe. We place high standards on our earthly judges and demand them to show no favoritism or partiality in their deliberations over any individual who has broken the Law. Multiply that need for a judge to be impartial by a billion, and you have an idea of how awesome and just God truly is. We should remember that sin isn’t always something we do, it’s something we are. It’s part of our nature. Our soul’s clandestine and clever inclination to live independently of God is proof sin is active in us to some degree. Since Scripture says death has passed upon all men because all have sinned, and mankind’s supposed “sinless human nature” has never hit the mark (the glory of God) anywhere, at any time, it seems reasonable to conclude all have been infected by this terminal “mark missing syndrome”. Some say it’s just a weakness or a frailty – but Romans 3 indicates there is an enmity, a willful (even demonic) resistance to God pulsating in us. That would concur with the concept we have the venom from the original snake bite, from our original parents still in us. Sin cannot exist in His presence – He is too holy and powerful. It’s like a piece of paper trying to exist on the surface of the sun. It just can’t happen without protection. Number 2 – The Second Thing God Doesn’t Know, is a Sinner He Doesn’t Love! God Doesn’t Know a Sinner He Doesn’t Love! Number 3 – The Third Thing God Doesn’t Know, is a Way to Save Us Except Through Jesus Christ! Think about this for a moment – the Bible says that Jesus dying on the cross for our sins is the wisdom of God. The all-knowing, Almighty God, the God who organizes all those atoms and molecules and cells and DNA and stars and galaxies, with all of His immense intellectual capacity, came to this conclusion. That Jesus’ sacrificial atoning death is the only way to redeem a person from sin and hell, while leaving their free will intact. Wow! Jesus dying on the cross for us speaks volumes; no it actually shouts to us, not onlyabout the greatness of God’s love for us but the severity of the horrific separation and damnation that must await all of us sinners. In fact just looking at the brutality of Jesus torturous death on the cross sends shivers through our imagination… what terrible place is He trying to save us from. How do we know that God doesn’t know another way to save us besides Jesus? Besides the fact we are dealing with the greatest intellect in the universe, the fact that God sends His only begotten son settles it for all eternity – if there was another way God would have found it. If you are a parent can you even imagine who much love you would have to have for another person to sacrifice your own child? This is love of a whole different order. 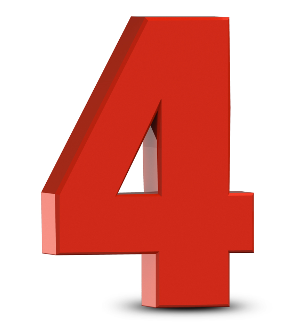 Number 4 – The Fourth Thing God Doesn’t Know, is a Better Time Than Right Now to Accept Jesus. When a drowning man is thrown a life-preserver he grabs it, When a man falling from an airplane is offered a parachute he grabs it. A person bitten by a king cobra is offered anti-venom he takes it. Every one listening to this message has now heard the Gospel – and is now accountable for what you have heard. You have received your spiritual MRI – you have seen the X-ray of your soul – now is the time to accept the surgery and take the medicine while there is time. Not one more second is promised to you or me. A car wreck, a freak accident, a stroke, a brain aneurysm could take us at any moment. Make the right decision for yourself and repent of living life independent of God and believe on the Lord Jesus Christ and his sacrifice He made for you today. Bow your knee and make Jesus the Lord and Savior of your life. You will not only escape the greatest death, but you will discover a new and abundant life full of joy and full of glory. You will discover the real reason you were put on this earth. To receive Jesus Christ into your life, pray something like this. Dear God in heaven. I confess that I am a sinner; I have missed Your holy standard in my life. I need You to change me. I repent this day of living my life independent of You and Your Word. I pray to receive Jesus Christ into my life, as my Savior and my Lord. Please forgive me and wash me by the precious blood of Jesus. Fill me with Your Holy Spirit, so I can be a new creation in Christ, and live the way You want me to live. I believe You have heard my pray and I Thank you Lord. In Jesus name, Amen. If you prayed that prayer anywhere in the world – I pray for you my brother or sister, for the Holy Spirit to fill you – to make you a new person in Christ. I declare that your sins are forgiven in the name of Jesus. I declare your inner-man is awakened to the Word and to the voice of the Spirit of God. I challenge you to read your Bible everyday (start with the book of John) and find a Bible believing Church or home group right away, so you can grow in the knowledge of the Lord; where you can be blessed and where you can be a blessing to others, as you learn about the spiritual calling and destiny on your life. Congratulations the angels in heaven are rejoicing that you are now part of the family of God.